"What are these guys on about now?" Admit it, that was your immediate reaction on seeing the headline to this comparison. And you'd be right, both these motorcycles are very, very different experiences, but they also have quite a few similarities. Both cost similar amounts of money and both have near-identical displacements and power. But most importantly, both offer a very unique bang for your buck. As it stands, the Avenger Street 150 is the most (and only truly) affordable cruiser on sale in India while the Gixxer SF is the sole fully faired bike available for less than `1 lakh. Still, a direct comparison between these two would not be sensible or reasonable. Instead of telling you that the Gixxer is better or the Avenger is worse, we're going to analyse the types of motorcycles here. Both look and function very differently but crucially, they will be used in the same environment. The question is, how does the cruiser and the faired bike work in everyday city traffic, out on the highway and in the emotional department? These motorcycles aim at grabbing the maximum eyeballs and both use inspiration to do so. This particular Gixxer SF from Suzuki's MotoGP race bike and Bajaj from the Harley Davidson Street 750. The Street 150's matte and blacked out effect, tasty alloy wheels, even the name, it's all a bit... let's call it 'influenced'. The result though, is quite pleasing. I like the Street's stance and the way that front alloy lures the eye. But from up close, the levels of finish just don't cut it with a messy mass of metal, bolts and cables near the base of the engine. In comparison, the Gixxer feels cleanly put together, more durable and offers nicer feeling switchgear too. 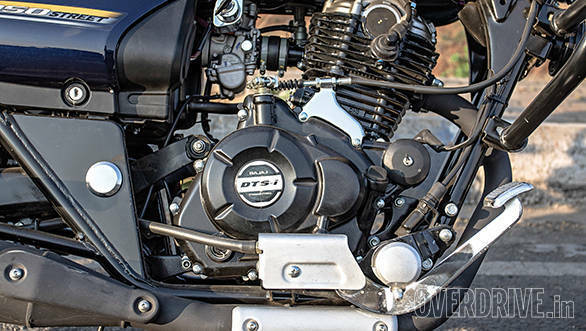 Where the old Avengers simply had borrowed motors from the Pulsars, the Street 150 is the first to get a purpose-built engine, an amalgamation of sorts of the Pulsar 180cc and 150cc motors that has nothing to do with the 150AS' engine. The results show and the new motor feels torquey and flexible, good characteristics for a cruiser. 14.5PS and 12Nm result in a fairly energetic performer but vibrations get quite intense at the top of the rev ceiling. 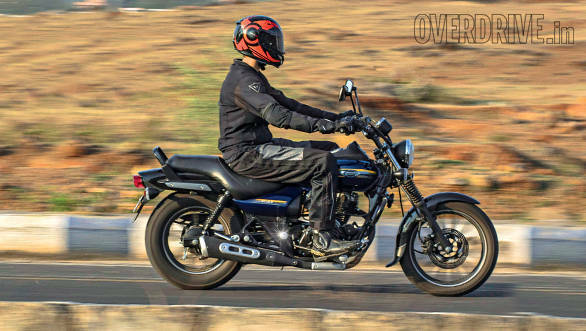 The gearbox is a 5-speed unit that is typically Bajaj  ultra smooth but without much feedback at the toes while swapping gears. 80kmph in fifth is a comfortable cruise but anything above starts to get quite vibey. Top speed is just north of 100kmph and comes up in well over 20s. It may not sound quick on paper but the Avenger feels punchy enough. It also manages to be pleasantly efficient, returning an overall 63.1kmpl, comprehensively outdoing the Gixxer's 55.7kmpl. The Suzuki makes up for its relative thirst with a lovely motor that is both tractable at low speeds and happy to rev to the redline in every gear. It's a fair bit quicker too with a 19.25s run to 100kmph and a top speed of 112.8kmph. Swing a leg over the Avenger and a familiar low seat, feet forward riding position greets but with a longer reach to the flat-ish 'street 'bar'. Shorter riders will appreciate the Avenger's low seat height but may find the reach forward to the 'bars a little too much. However, the street bar does generate extra leverage at the front end which is useful in traffic. Still, I wouldn't want to tour with this riding position and my lower back and shoulders were beginning to get stiff after an hour in the saddle. Swapping the street bar with the pulled back handlebar from the Avenger Cruise 220 may actually make for a more comfy riding position. 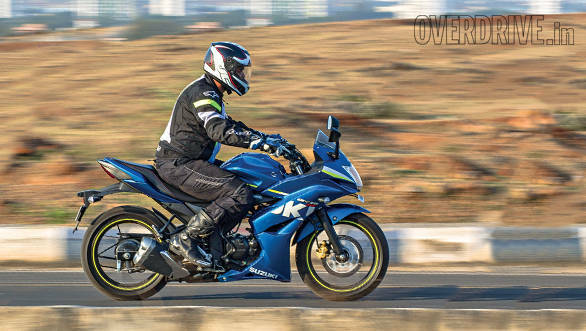 The Gixxer, meanwhile, has your back almost entirely upright but folds the legs back in a more sporty twist. It is closer to 'normal' than the Bajaj and will appeal to a wider audience. The Avenger surprises in the city, perhaps because I was expecting an unwieldy experience like you get with bigger cruisers. Despite the raked out front end, the Avenger's front wheel felt responsive and light. The turning radius is also quite short. Once you get used to having your legs in front of you, I see no reason why this should be a more tedious city riding experience than any other motorcycle. The mirrors are large and usable and I also found the brakes more than sufficient. My fears of a vague and unpredictable front under braking were also unfounded. It doesn't have quite the same feel as the Gixxer but the MRF Zapper rubber feels reasonably confident and reassuring. 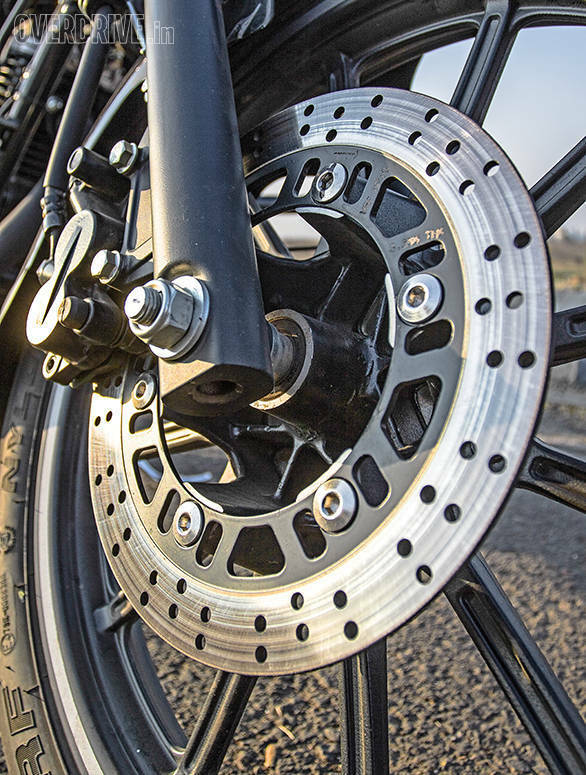 The 240mm Endurance front brake has good lever feel and progression and was perfectly upto the task of slowing the Avenger down. The difference between the two is immediate when you hop on the Gixxer. My foot instinctively hit the gear lever thinking it is the footpeg but I appreciated the higher seating position that improves vision of the traffic ahead. The riding position is unchanged from the naked Gixxer since the company stuck with the handlebar instead of moving to clip-ons. I did, however, find that the Gixxer's suspension set-up was more comfortable than the Avenger's over time. The new Avenger has a stiffened rear to prevent it from bottoming out, a common complaint with the older model. The issue isn't that the rear is too firm but that it can get a bit bouncy over broken roads and this takes a toll on the lower back. On a winding road, the Avenger settles into a smooth stride, feeling long but stable. Push it hard and the footpegs will touch down fairly quickly. The Bajaj, by virtue of its design, has absolutely no inclination to keep up with the Gixxer on mountain roads, feeling much happier at a more sedate pace. 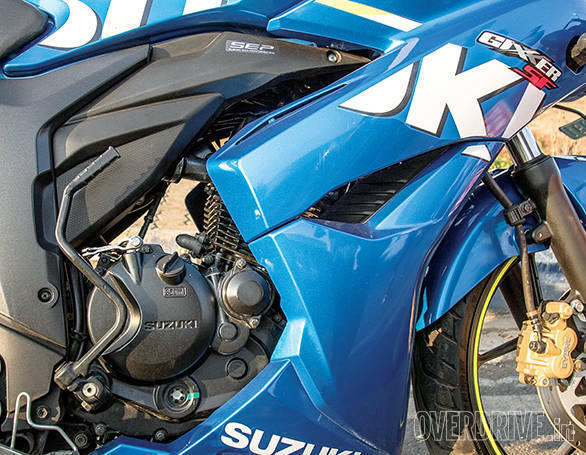 The eager Gixxer, meanwhile, will give and give, thrilling you with its dialed in front end and super-composed chassis till you lean it deep enough for the metal tipped pegs to grind the road  it remains our happy handler in the sub-200cc category. 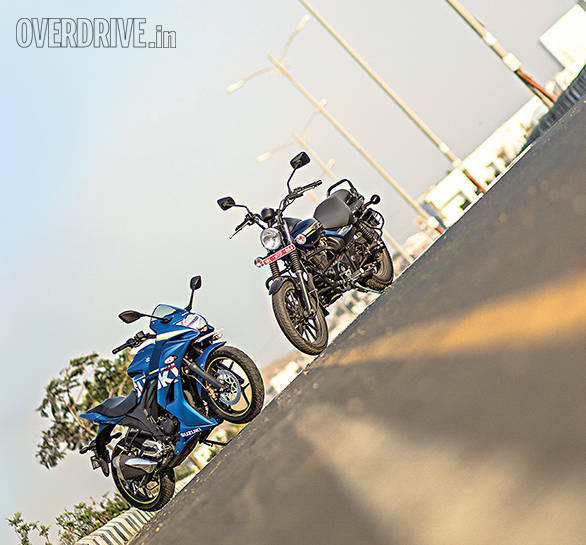 If you look at it objectively, the Gixxer offers more than the Avenger like a comprehensive instrument display, radial tyres, more performance  the list continues. If you buy the naked Gixxer it actually works out a little cheaper than the Avenger. In terms of sheer logic, the Suzuki is the better motorcycle, but there wasn't much doubt about that to begin with. However, a big part of the buying decision here is the emotional connection. A prospective Avenger buyer isn't going to consider the Gixxer and vice versa. The Avenger Street 150 succeeds, far better than I'd expected, at giving you that relaxed cruiser vibe. And the key point is it does so without sacrificing vital aspects like performance, brakes and dynamic ability, all within the realms of reason, of course. It handles the daily city slug in its stride and will be a pleasant partner on short highway rides as well. For those who dream to cruise on a shoestring budget, the Avenger delivers well. The Gixxer? It simply reasserts its loveliness with every ride.